Idli is a cereal-pulse based fermented food. 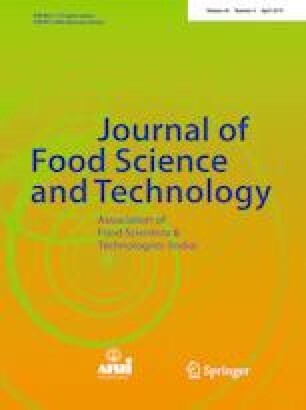 This study profiles the qualitative and quantitative analysis of biogenic amines formed in the fermented idli batter prepared using varying proportions of rice to black gram dal at 1:1, 2:1, 3:1 and 4:1 (w/w) ratios and stored at 30 and 4 °C for 7 days. Histamine, tyramine, putrescine, cadaverine, spermidine, and spermine were investigated for the first time in the idli batter using HPLC technique. Putrescine and cadaverine were the predominant biogenic amines found in both prepared and market samples. Histamine and spermine were not detected in all batter samples. Increasing the proportion of rice in the idli batter resulted in the decrease in the total biogenic amines formed in the fermented batter with batter having more black gram dal (1:1) showing the maximum formation of total biogenic amines. Idli is a safe, easily digestible food to consume as the highest total biogenic amines quantified (366.87 µg/g) in 1:1 variant batter was below the harmful limit (1000 µg/g). The online version of this article ( https://doi.org/10.1007/s13197-019-03609-9) contains supplementary material, which is available to authorized users. The authors are grateful to University Grants Commission for the funding.